A Link Between Gum Disease And Diabetes? Next week is World Diabetes Day. In the United States millions of people suffer from gum disease and diabetes. However, few people are aware of the possible link between these two chronic illnesses. 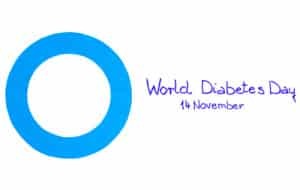 By protecting your oral heath you help safeguard your smile against the disease, even if you are diagnosed with diabetes. Why do we develop this disease? The issue occurs when the gums undergo inflammation. The inflammation could be the result of poor oral hygiene, hormonal fluctuations, genetic predisposition, the use of certain medications, or chronic illness. The inflammation causes the gums to actually pull away from the teeth, forming pockets at the gum line. Once bacteria invade the pockets the disease can set in. Over time, periodontal disease can lead to a number of serious oral health issues, such as adult tooth loss. If you think you recognize one or more of these possibly warning signs then contact your doctor right away. Identifying and treating the issue in the early stages can protect the stability and overall health of your smile. If you have any questions about treating periodontal problems or recognizing the symptoms then please contact our office today. How does this disease link to diabetes? First, people who have disease have a greater chance of developing gum problems, so much so that many consider gum disease to simply be another complication of the disease. This is due to the disease causing the patient to be more prone to infection, leading to the onset of periodontal issues. Likewise, gum disease can affect how a patient regulates sugar, making the risk of diabetes higher.